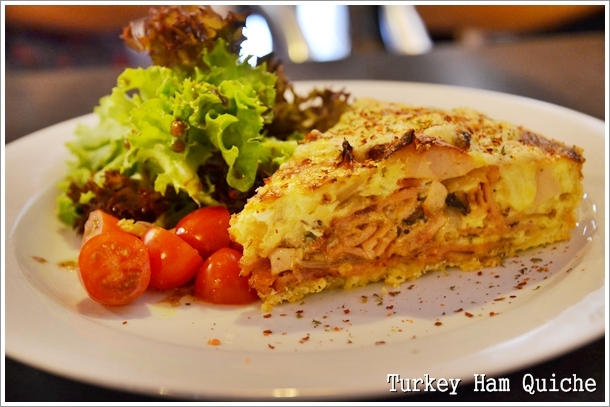 Turkey Ham Quiche (RM12.90/USD4.30) – One of her signature creations; previously available only on weekends, not on a daily basis as per request. Tammy bakes hers with a heart. Okay, so greed is but one of the 7 deadly sins known to men. Oh dang, gluttony too. Infused with unenviable two deadly sins got this Motormouth hesitant at first, to share what could be my current favourite cafe in Ipoh. Don’t flinch. Yeah yeah … so it’s true that I rarely go back now. Much akin to being branded as someone who turns his back on his hometown. But not too worried. I promise that you will see a post or two every now and then on food from Ipoh, for I have sworn allegiance; to some extent; to cover most, if not ALL of the eateries worthy of the limelight in Ipoh. Right now? I am barely halfway there. For today? Let’s see what this 9 months’ old cafe has to offer …. Equipped with a menu printed on a single piece of green paper, Tammy’s Kitchen‘s loyal legion of fans knew all along what they wanted; rendering the menu almost …. useless. And if it’s pies, quiches, cakes and pastas that you’re searching for, then you have come to the right place. 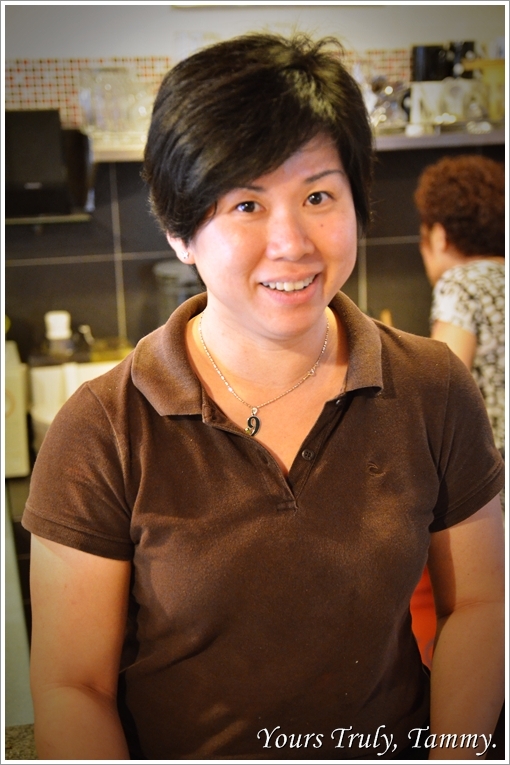 Tammy’s Kitchen is operated by an affable lady and her troops of family members. No, in case you’re wondering; she has no previous experience in running a restaurant or cafe. This is her first venture in the F&B business, but so far so good. Wait, make that so far … DAMN good. 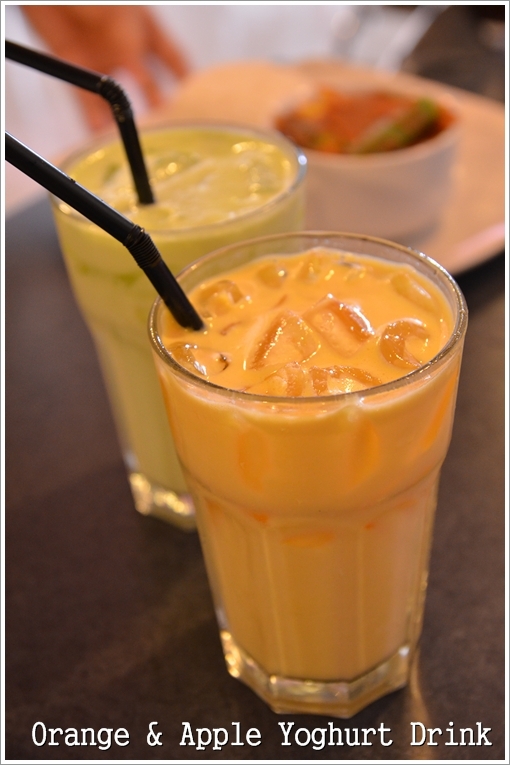 Orange & Apple Yoghurt Drink (RM5.50/USD1.80 each) – Creamy concoction of yoghurt and fresh fruit juices. Delectable mean of combining a drink and a dessert? 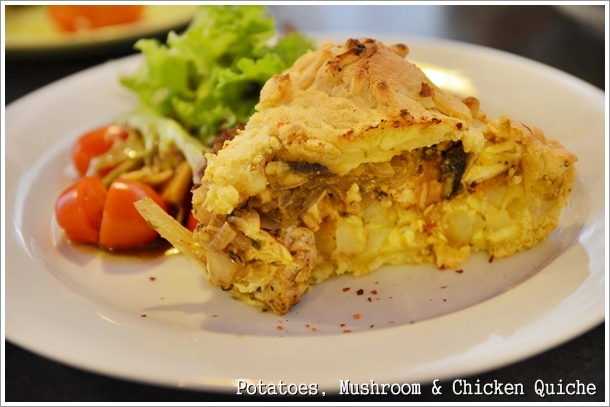 Chicken Pie (RM6.50/USD2.20) – Only on weekends, though. Worth every cent, seriously. 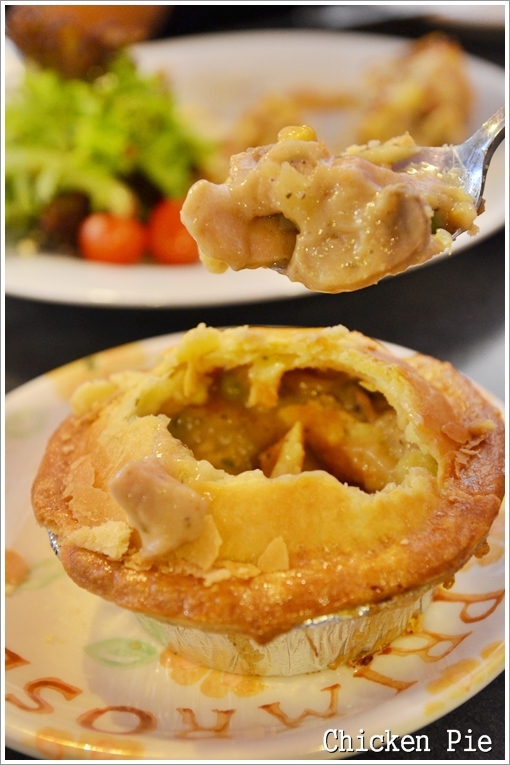 One of the best homemade chicken pies in town. She makes fresh quiches on a daily basis now; and they’re not even on the permanent menu. If you can even call that piece of green paper that. The menu covers quite some grounds; from about 20 types of spaghetti to various chops and even Asian delights like noodles and rice. Assam Seafood Rice (RM10.50/USD3.50) – And if you’re not a pastry person, don’t pout. 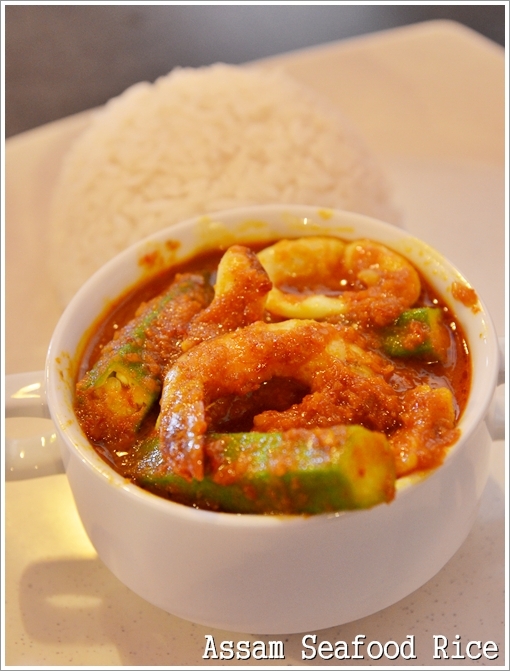 Go for the Assam Seafood rice, loaded with prawns, squid and fish slices in a delightfully piquant and tangy assam gravy. Polish those white rice clean, effortlessly. 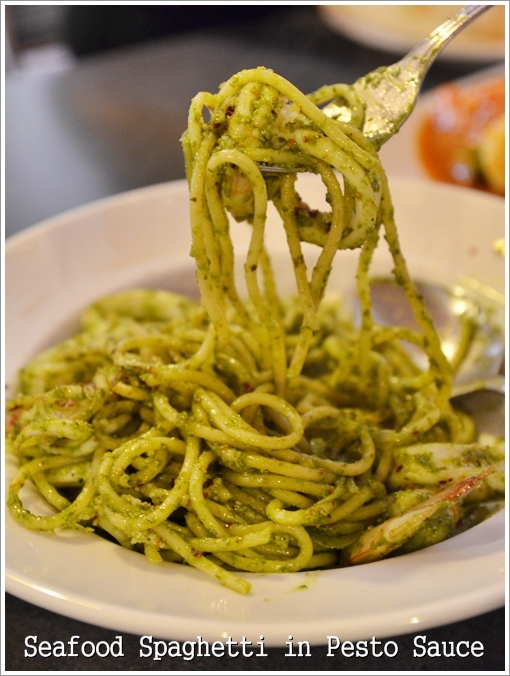 Seafood Spaghetti in Pesto Sauce (RM14.90/USD5) – Chose the last item on the spaghetti section; and came out triumphant. A fresh, creamy pesto sauce made from scratch; with spaghetti cooked al dente, and shrimps and squids thrown in for good measure. 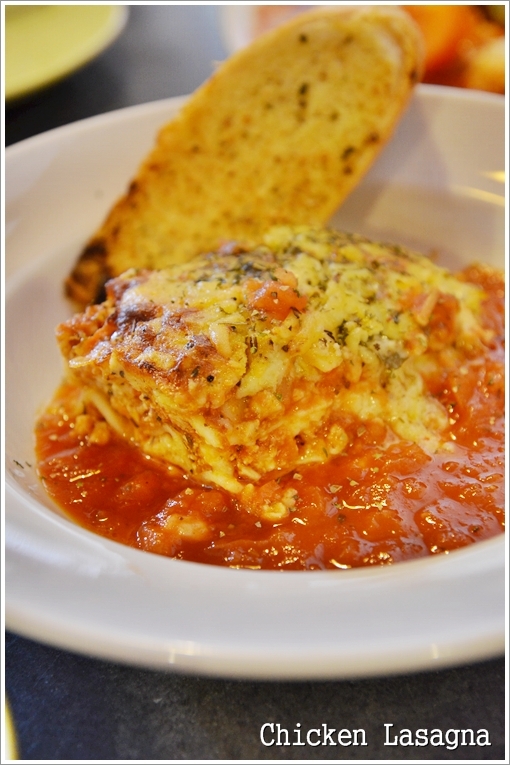 Lasagna (RM12.90/USD4.30) – Also a weekend only special, call in advance to order this just in case they have sold off every portion. Every single dish was good. It has been ages since everyone unanimously agreed on a positive rating. The four of us walloped everything clean without much persuasion. We almost over-estimated our vacuum compartment in the middle region, placing orders left and rights to an extent where Tammy started to question the logic behind the successive orders rattled off in lightning speed. But we managed, and got our cravings appeased. If there’s one item you can’t miss from her repertoire, make that the QUICHE. Was she ever the pleasant personality … very down-to-earth. Bear in mind that they might be a little short on the staffing front; as she runs the place with a few family members only. So expect a slightly longer wait than your usual cafes. 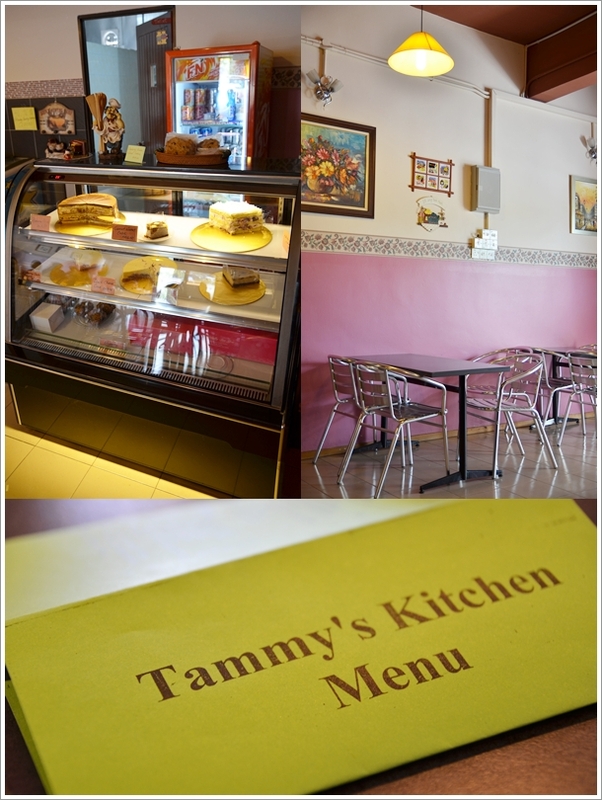 Tammy’s Kitchen serves pork-free food at reasonable prices, in an air-conditioned environment, with no frills dining concept. Homely, with fresh foods cooked/baked on a daily basis, and wholesome enough without preservatives or MSG. And no, this was not an invited review. Nor do they even believe in one. Oh, take note that they serve a pretty kick-a$$ cup of kopi-O (black coffee) too. On my next round, I will probably waltz over gingerly to the counter for a quick glance of what’s the special(s) of the day, and then maybe get myself a Carbonara or a slice of her irresistible quiche or two. Business Hours : 12.00pm – 8.00pm. * On the road connecting Ipoh Garden East to Sunway City, Tambun. Once you have passed Citrus Wine & Dine on your right, go forth a short distance. Tammy’s Kitchen is on the row of shops same side as Citrus, further down the road. * You can pre-order her cakes, 3 days in advance. 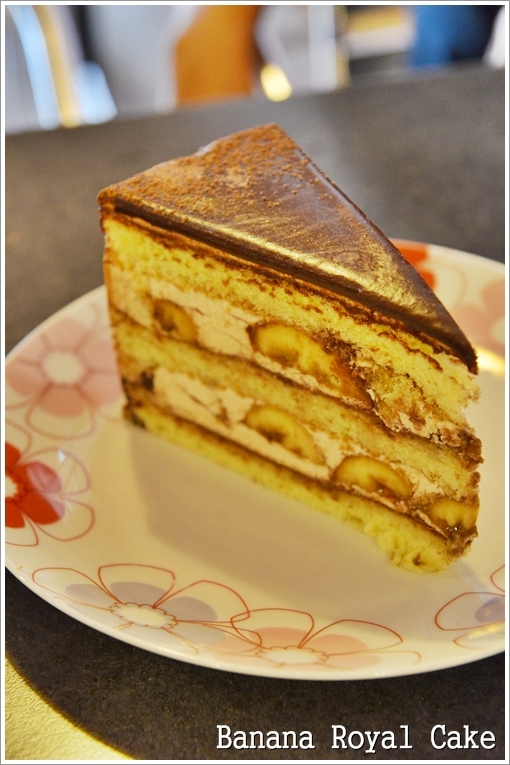 RM90 for the usual cakes, and RM80 for the cheese cakes. Yum! Good quiche is always hard to come by. Yes indeed. One bite and I was sold. Such good quiche loaded with flavours and ingredients, I almost wanted to order another slice, had it not been the other equally filling dishes. Yes anne. I was trying to contain this hidden gem myself, but well … memories will fail me if I don’t write this soon. So better put them into words. Let’s hope this won’t affect the quality of her quiches, pies and cakes. be my guess J2Kfm, must try bercham taman pakatan (sen heng fatt) coffee shop (Fei lo Western food) chicken chop rice! Yeah … hence I am hoping for more posts on classic eateries in KL from you guys …..
Yeah, the quiche here is really good.Only discovered it recently.Lately alot of cafes similar with The Secret Recipe concept is springing up in Ipoh. So Secret Reicpe is going have stiff competition.There is one cafe in De Garden by the name of The Brownies selling delicous cakes and tarts/ice cream. Only thing here is they don’t sell those savoury stuff.But if are looking for delicious homemade cakes, pop over there and try their chocolate moist, tiramisu, carrot cheese, belgian cheese, pineapple tarts etc and you will thank me for recommending. Thanks Anne. Yeah, I have been itching to try the desserts from The Brownies. Never knew that you can sit there and eat? Will do so the next round I guess. Thank you for recommending this! Was looking for good Quiche since I come back from the UK. Yeah …. well said Kenny. Passion adds fuel to the taste. quiches!!! i miss it. looks real good there! the other pastries look equally delectable. gosh am hungry! Oooo I think i know where. Lavender cafe used to be there I think. So near to my house!! YES! Was about to ajak you go, but you go back so seldom now ….. you still remember where’s Ipoh not? Would always drop by her place whenever I am back.I love her chicken pie but have to book them first though! Can’t wait to try her quiches( though I make a good one myself..hehe) So far, one of the best ‘western/fusion’ place in Ipoh. Yeah, I was surprised too. And it took me a good 9 months before discovering this. Actually, not by myself. My parents went there 1st, and then my aunt was raving about this place. now i know where to go for good cakes and cafe fare in Ipoh next trip down 🙂 cheers! You also dunno go to Ipoh one … how to ajak leh …. Wow, this restaurant is just near to my house. I have been wondering what menu it serves for a while. Truth be told, its front signage doesn’t really look appealing or interesting…It seems it is a true “crouching tiger, hidden dragon” 😛 Gotta try it out tonight! Just back from dinner at Tammy’s…1 word => ORGASMIC!! I think this is the first time I tried quiches and I am hooked!! Definitely going for 2nd visit….SOON!!! Glad to hear that. Haha … orgasmic wouldn’t be the exact word that I will use … but yeah, I guess you’re hooked as much as myself was. Yeah! Talk about Tammy’s … maybe I should pay her a visit again one of these days. Love her Salmon Quiche and also not forgetting her Lamb Stew ! I just came back from Tammy’s Kitchen. Before I went I read your review here. Then over there I ordered turkey & ham quiche & orange yoghurt. They were really yummy! You’re most welcomed, Min Min. Yeah .. thinking of going there for the quiche one of these days. Sure … just put credits linking back to the original post would do. I must say lets meet up J2KFM show me where ipoh good food! 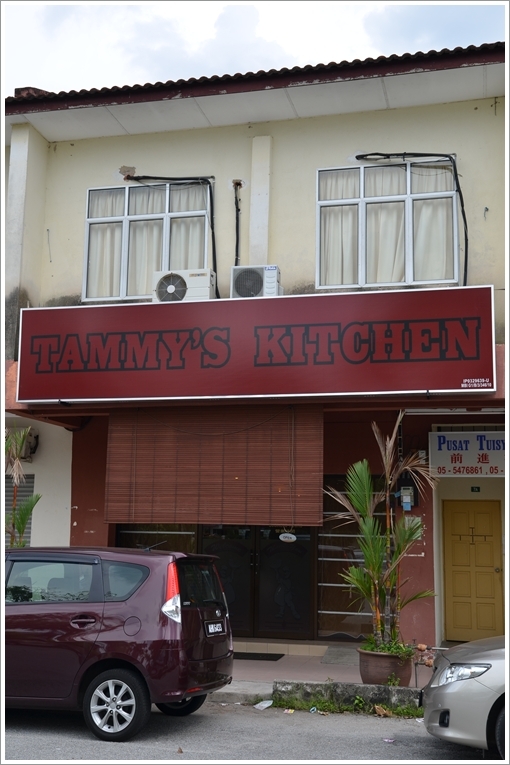 Recently, we were on holiday to Ipoh from Australia and accidentally stumbled on a fantastic restaurant called Tammy’s Kitchen. We have all kinds of cheese cakes in Australia, but never tasted one as good as those served in Tammy’s Kitchen. Crunchie chocolate base cheesecakes, yumm!!! The coffee was delicious, so were all the Quiches, steaks and spaghetti. We were there almost everyday, got there early before all sold out. My trip to Malaysia was unreal. Praises coming from someone who resides in Australia? That’s surreal. Their quiches are still the best I’ve eaten, even compared to those in KL. Mate, I am coming back soon for another round of feast delicious at Tammy. I had a rather unpleasant late lunch here. Long wait for service is expected but service and attitude of the only 2 person serving customer (Tammy herself and old lady) was SNOBBISH! Cafe was filled with stuffy kitchen “aroma” and by the end of my lunch, I walked out of the shop with that smell all over my body. Credits to the cakes and muffins but not a cafe with good hospitality. Snobbish? Seriously?! Maybe not as attentive for they’re short on staff, but the family-run cafe has been anything but snobbish. I don’t mind waiting if the food is good. They are not snobbish but simply busy. However, some customers are inconsiderate, they spend too much time chatting instead of eating, hence using up table spaces. No business can afford that. Even though all customers are right, they still need to considerate that others are making a living in such a difficult and competitive situation. My wife & I nvr fail to stop by this cozy cafe each trip to Ipoh..
Cakes n sandwiches r memorable as well!